Toward the end of the nineteenth century, French vocal music was under the influence of Wagnerian declamation, and moved progressively away from a free, melismatic style. The vocal music of Fauré, Charbrier, Chausson, Hahn, and others clearly exemplify this development. For Claude Debussy a similar progression can be seen within his own vocal settings during the 1880s. By the time of Ariettes oubliées (1885–87) Debussy’s approach to vocal setting was fully declamatory in nature. In his Cinq poèmes de Charles Baudelaire (1887–89), the voice is further limited to monotone recitation over a piano accompaniment that carries all the musical surroundings in a thick, rich texture. This approach also predominates in Debussy’s later opera Pelléas et Mélisande (1902). In Printemps, however, melismatic, textless vocal writing is the norm. That Debussy’s imagery in the above letter is borrowed from the visual arts is no surprise, since a painting by Marcel Baschet, who had been inspired in turn by Sandro Botticelli’s Primavera, was the inspiration for Printemps. In addition, it was this same work that was called “Impressionist” by the members of the Académie des Beaux-Arts. Debussy expected that his Printemps would be performed with his other works, but the Académie forbade the performance of a work that it had condemned three years previously. Debussy stubbornly refused to agree to the exclusion of his score. He preferred to forgo the honor and the advantages resulting from this concert. In the original version of Printemps, the loose sharing of thematic elements between voices and instruments stretches across the two movements. This larger cyclical form is reminiscent of works by other contemporaries of Debussy, notably Franck and d’Indy; motivic recurrences seem similar to the leitmotifs of Wagner. Thematic interaction between voices and instruments can be seen at the very opening of the first movement. Following the first primary motive (mm. 1–4), comprised of two two-measure statements of a lyrical gesture, an iambic secondary motive sounds in the first piano part, immediately echoed an octave lower by the female voices. 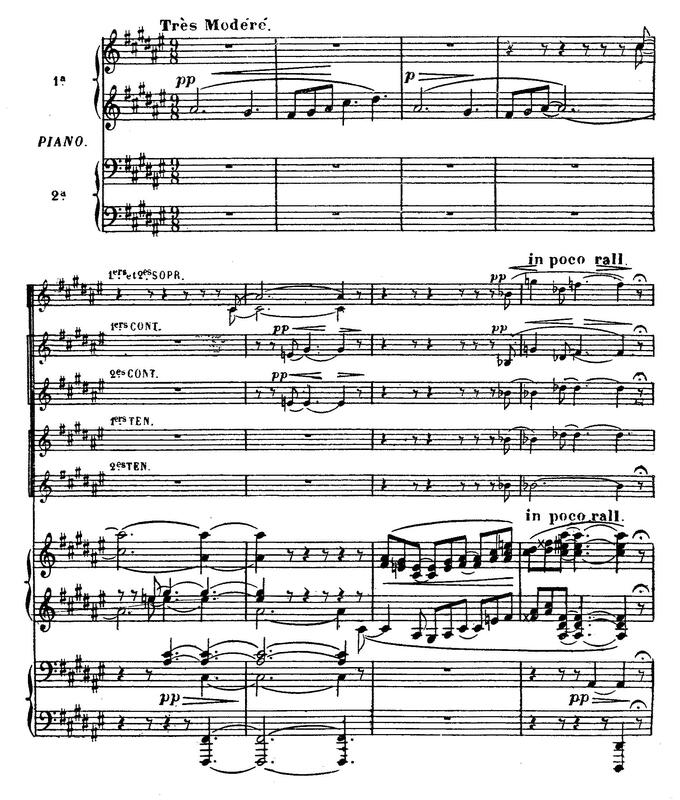 Motivic interactions between voices and instruments in this piece, as in the example, serve as Debussy’s “mingling of the colors.” However, more typical is the presentation of musical ideas separately by the two groups within the larger sectional design of the work. 1 François Lesure and Roger Nichols, eds., Debussy Letters, trans. by Roger Nichols (Cambridge, MA: Harvard University Press, 1987), 24. 2 Léon Vallas, Claude Debussy: His Life and Works, trans. by Maire and Grace O’Brien (New York: Dover, 1973), 41. 5 François Lesure and Roger Nichols, eds., Debussy Letters, 24. 6 Claude Debussy, “Printemps,” La Revue musicale (15 February 1904): 25–32; (1 March 1904): 33–40; and (15 March 1904): 41–48. 7 James Briscoe, Claude Debussy: A Guide to Research (New York: Garland, 1990), 36. 8 Claude Debussy, “Printemps,” La Revue musicale (15 February 1904): 25. 9 Louis Laloy, preface to Printemps, by Claude Debussy, La Revue musicale (15 February 1904): 25.